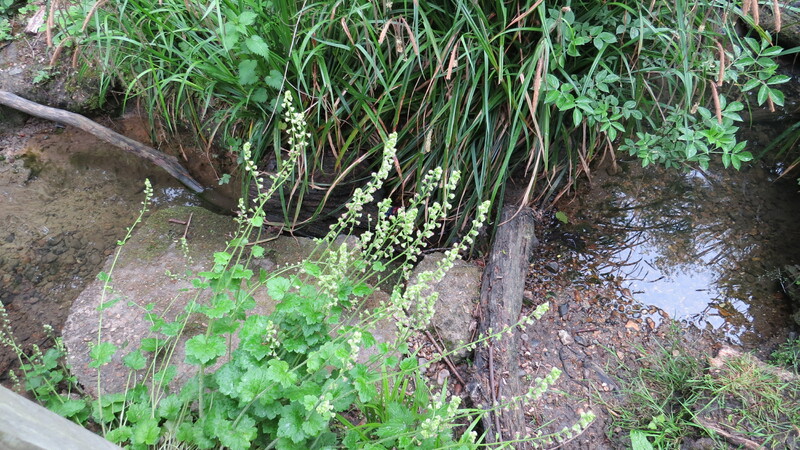 Dear Readers, during a walk in Coldfall Wood last week, I was surprised to see a stand of Fringecups alongside the stream. 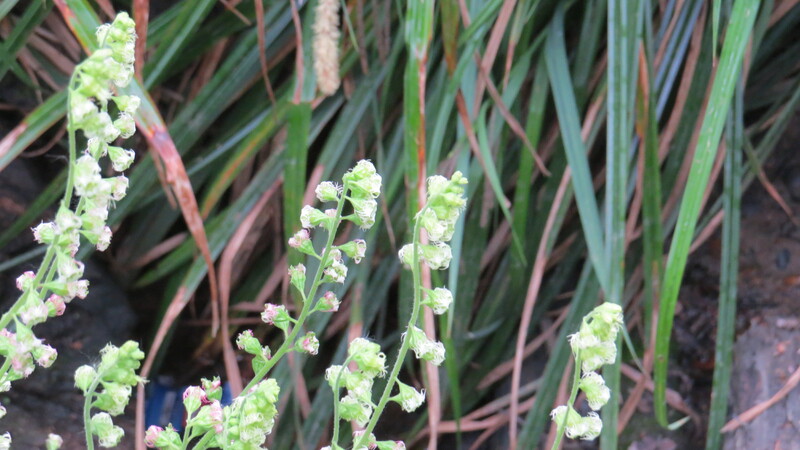 They are a member of the Saxifrage family, although they look very different from the others, with their strange green-pink flowers peering like giraffes over their neighbours. 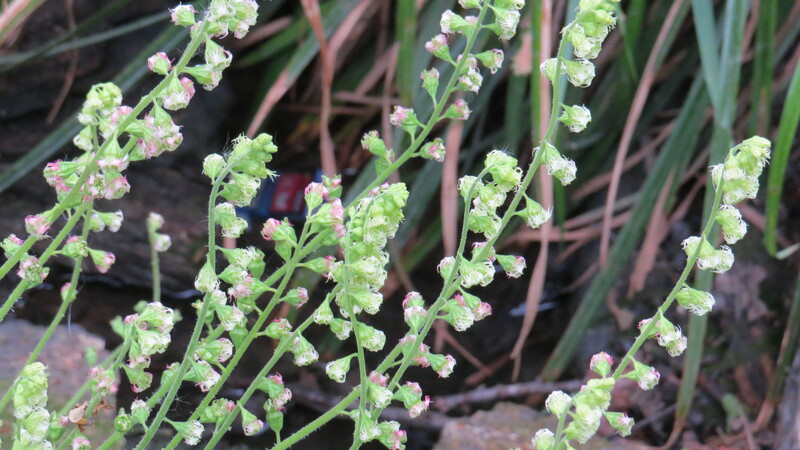 They are the sole member of their genus, and as such are somewhat out on a limb: most saxifrages are five-petalled, open-flowered plants, although a few do share the long stem of the Fringecup. 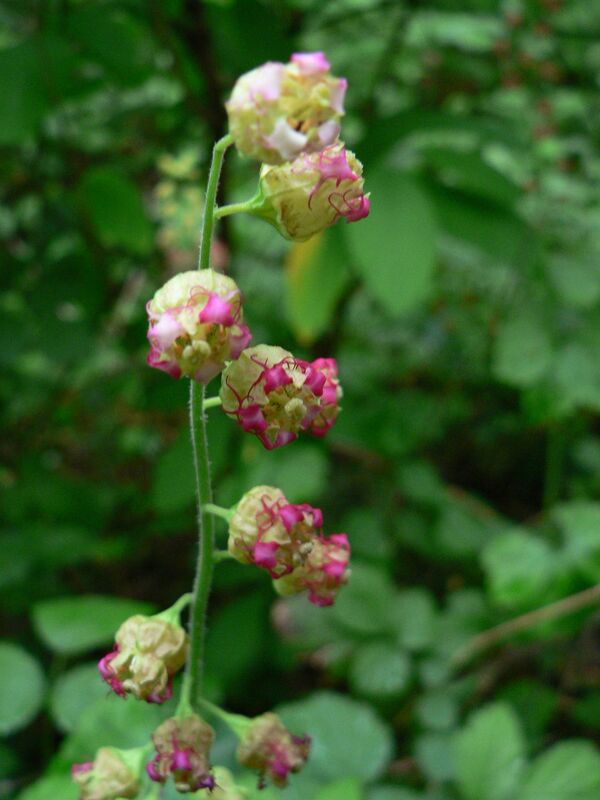 As the flowers grow older, they start to change from greenish-white to pink, and even to red. This is a plant that my North American readers might recognise, as it is a native of the north-western corner of the continent, including Alaska, California, Idaho, Montana, Oregon, Washington, Alberta and British Columbia. It is a plant of woody, shady, wet places, and in my garden at least the bees are very fond of those unassuming flowers. Here in the wood, they have certainly made themselves at home. They mix happily with the nettles, the violets and the marsh marigolds, and keep themselves largely to themselves. It is not difficult to see how it has made the leap into ‘the wild’ – I have it in my own garden, and there are many varieties for sale. Its tolerance of shade is a great point in its favour in many people’s eyes. Fringecups growing in my garden. I think that this looks like a fairy-tale plant, ethereal and delicate. 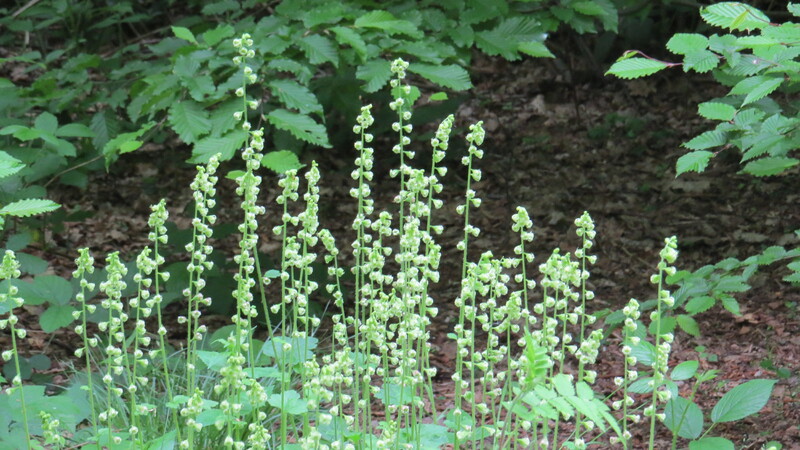 The flowers look as if they could be hats for pixies, and, indeed, there is a Canadian folktale that elves ate Fringecup in order to improve their night vision. The First Nation Skagit people used Fringecup to make a tea for treating many illnesses, including loss of appetite. In many of the books that mention Fringecups, there is a reference to its fragrance. I have to admit that this was not something that I’d noticed so, in the interests of research, I went down to the garden to have a sniff. And there it is, a faint hint of sweetness, as fragile as the scent left on a silk scarf. This is a modest plant of strange and elusive beauty, which only reveals itself if you have the time to stop and look. 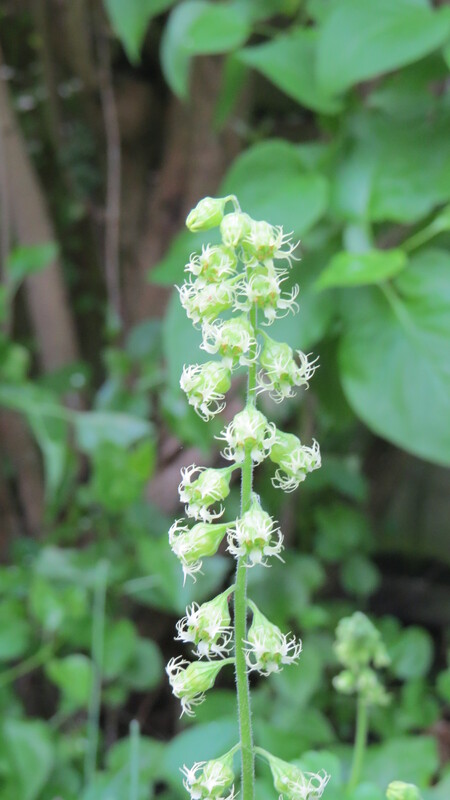 This entry was posted in London Plants on May 20, 2015 by Bug Woman. Such an unassuming flower. Yet it is not small! I must have overlooked it. I’ll certainly keep my eyes open for it. Ahh BW you may have identified for a plant which I can incorporate in a shady area that I have been scratching my head over for a time now. Though not yet prepared for planting just yet I have been considering what plants will thrive there and of course I am always thinking of what else they may attract. The usual shady suspects will probably be incorporated;- Hosta, Blue Bell, Lily of the Valley, Ferns etc but Finger Cups are now a definite must have so thank you for bringing them to my attention. Hi John, a plant that works really well under the trees n my garden is called Dusky Cranesbill, alias Geranium phaeum – it has very simple, chocolate-coloured flowers, growns alongside my Fringecups, and the bees absolutely love it. I’ll post a picture on the Facebook page so you can have a look…. Loving the weeds, as ever! And this one with a fragrance, love it. Thank you Harriet! Glad you like the blog. Yours is very fine too…. Hi Lynn, yes, they are similar to Coral Bells now you mention it, I’d never made the link! And the song is new to me, so thank you so much for that. I love the Pacific Northwest. 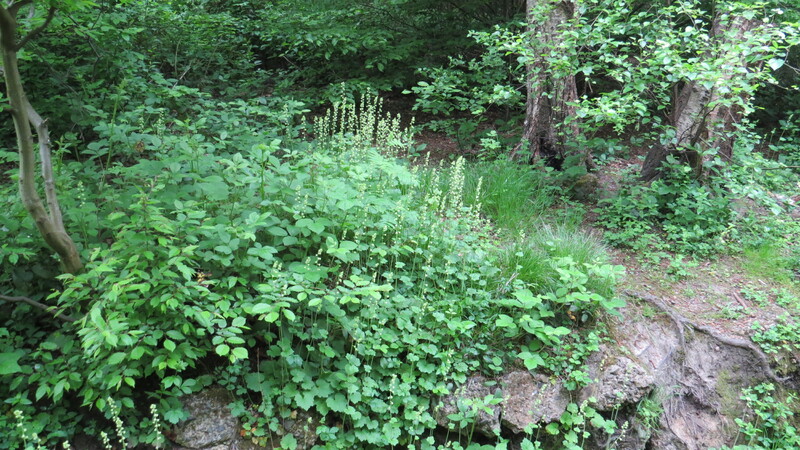 I honeymooned in Vancouver, and loved the temperature rainforest environment there….